I suppose a temporal adventurer must take her ‘Happily Ever Afters’ where and perhaps more relevantly, when she can; what’s more, if you’re going to attempt a relationship with another time traveler then it’s probably best to keep your stories straight and your diary updated. Because, as we know, ‘we’re all stories in the end’ and if your parents were also time travelers and you’re a sort of Hybrid possibly with a Time-Head conceived in a TARDIS and born on an asteroid called Demon’s Run then it falls to you to make it a good one. Yes The Husbands of River Song was a little continuity heavy but was all the better for it (despite the fact my favourite argument is that Doctor Who is a delightful continuing serial precisely because it has no continuity). Having said that, it took a subsequent, post-Christmas viewing free from the hazy effects of alcohol and mince pies to really appreciate what it was doing. That is, to present us with the lovely Christmas present of a dénouement for the bitter sweet romance that has been the Doctor and River (Otherwise known as The Time Traveler's Wife which makes this story’s title even more meta-ironic). I think we can safely ignore the first 40 or so minutes which consisted of a moderately enjoyable screwball comedy space romp with multi-headed androids and stunt-cast comedians. Although the meta-symbolism of River marrying a series of replacement heads alongside her unfolding picture wallet of previous Doctor’s head shots (In handy chronological order) probably warrants a closer reading at some point. ‘Funny thing is, this means you've always known how I was going to die. All the time we've been together, you knew I was coming here. The last time I saw you, the real you, the future you, I mean, you turned up on my doorstep, with a new haircut and a suit. You took me to Darillium to see the Singing Towers. What a night that was. The Towers sang, and you cried’. ‘Nobody really understands where the music comes from. It's probably something to do with the precise positions, the distance between both towers. Even the locals aren't sure. All anyone will ever tell you is that when the wind stands fair and the night is perfect, when you least expect it but always when you need it the most there is a song’. The secret of this tale though, to be discovered like a sixpence in a plum pudding or a diamond in a brain, was hidden in plain sight and found at the end. Indeed at the risk of invoking that most irritating of River’s catch-phrases “Spoilers!” we need to look beyond the end of the narrative and examine the final caption. Of course it’s there to cement the concept of River and the Doctor’s love story being like a fairy tale and naturally invokes its companion caption ‘Once upon a Time’ a favourite trope of show runner Steven Moffat. But isn’t every Doctor Who story about ‘once upon a time’ or at least ‘time’? Once again we get the concept of a discrete pocket of time like the two billion years inside the Confession Dial in Heaven Sent, the space between heartbeats of Clara’s post death adventures and the fateful immortality of Maisie William’s Ashildr. This time it’s the 24 year long night at the Singing Towers of Darillium where the Doctor and River get to share their happiness. Actually the idea of ‘Ever After’ is interesting in itself. Suggesting a time that comes after time, the contradiction of a continuation of the story after the narrative has ended. Then this, like the other words, eventually disintegrates into stardust. As must we all eventually, even if we live to see the End of Time, which, incidentally, the Doctor has visited on numerous occasions, most recently in this very series finale. It must be getting a bit crowded there, if only with versions of himself. So if there was a moral to this sweet Xmas truffle of an episode with a bitter sweet coating it might just be that everybody's story has its beginning and its ending but not necessarily in that order and time-travelling adventurer or not, in matters of the heart it’s very easy to lose your head. DOCTOR: Every night is the last night for something. Every Christmas is the last Christmas ... Times end, River, because they have to. Because there's no such thing as happy ever after. It's just a lie we tell ourselves because the truth is so hard. 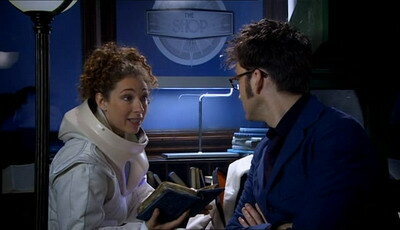 RIVER: No, Doctor, you're wrong. Happy ever after doesn't mean forever. It just means time. A little time.